The Antennata Lionfish, Ragged-finned Firefish, or Spotfin Lionfish is distinguished for it's strikingly different pectoral fin rays, and it's large black and white "antennae"! A good community fish as long as it's companions are too big to eat. The main characteristic of the Antennata Lionfish, Ragged-finned Firefish, or Spotfin Lionfish is the lack of connecting tissue in between the spines of the fin rays. The pectoral fins are connected only a short ways out from the body while the dorsal fins are not connected at all. They do have venomous spines, our motto is "Don't pet the fish"! Antennata Lionfish eating from a feeding stick. Although the video quality is not perfect, this video needed to be chosen due to the wonderful training that was done for this Antennata Lionfish. All lionfish do need to be trained to eat from a feeding stick, since it is not always possible to have live foods and this aquarist did a great job. It is funny to watch the Lionfish respond to the stick even when it was on the outside of the tank! This Antennata Lionfish has found a good home and with proper feeding will reach 8" in no time. Remember do not feed goldfish to any marine fish. Brief video of an Antennata Lionfish for sale. This video of a juvenile Antennata Lionfish is a perfect example of their coloring! This little lion will grow up to 9" in captivity, and like his relatives, he may even live up to 18 years. Anyone who may want to buy this lovely lionfish has made a great choice due to their more manageable size and hardier disposition when compared to dwarf lionfish. Provide a minimum tank size of 55 gallons (208 liters) with rocks that are formed into caves or crevices. Avoid shrimp, crabs and small fish, which they will eat, and large eels and frogfish which will eat them. Large Angelfish, triggers, puffers and other scorpionfish should not be in the same tank for various reasons. Antennata Lionfish in the wild. This video shows a possibly perplexed Antennata Lionfish, who wants to get into this cave for the day! You can see at the bottom of the screen a black spiny urchin who had the same idea. The lionfish has met his match and seems wary of this intruder. So yes, there are things that lionfish don't like or eat them. They are great alone in a 55 gallon tank or with others from the same genus, added at the same time and in tanks that are 25 gallons more per lionfish. Three different Pterois in the same tank is fine with each having their own places to hid and if the tank is 100 gallons or more. The Antennata Lionfish, Ragged-finned Firefish, or Spotfin Lionfish is easy to keep. Lionfish are among the hardiest of all marine fish. In the beginning though, make sure you have a reliable supplier of feeder fish. Feed live fish in the beginning, gradually enticing them to eat frozen of fresh foods such as silversides and lancefish. Other crustaceans and seafoods can also be tried. Antennata Lionfish, Ragged-finned Firefish, or Spotfin Lionfish are found in the Indo-Pacific: East Africa to Marquesan and Mangaréva islands, north to southern Japan, south to Queensland, Australia and Kermadec (Ref. 8879) and Austral islands. Occurs in lagoon and seaward reefs. This fish hides in crevices under rocks and coral formations during the day and hunts at night. Typically they hunt with head towards the safety of their hide-out or a nearby narrow passage. They feed on shrimps and crabs in the wild. In the aquarium they can be fed meaty foods and small fishes. Sociable and peaceful, can be considered a community fish as long as the tankmates are not small enough to eat! See general breeding techniques in the Breeding Marine Fish page. Antennata Lionfish, Ragged-finned Firefish, or Spotfin Lionfish adults can grow to 20 cm (8 inches). Will swim anywhere their prey takes them. This fish is generally readily available. Yes they will normally grow back. This is a simply stunning fish with exquisite colours. My fish has settled in perfectly with the rest of my fish and has not bothered any of them. The smallest is a firefish and I also have a cleaner shrimp which even tries to 'clean' the lionfish. It even feeds on algae pellets which I originally bought for the tangs. My advice is go and buy one! nfortunately, the photo shown and ID'd as Pteoris antenatta is not an antenatta, but the closely related Pterois mombassae. 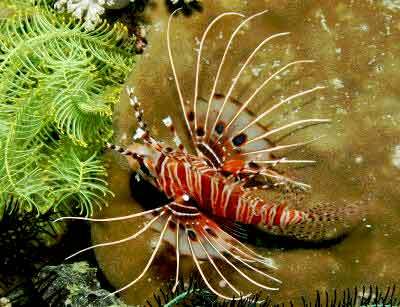 Mombasa lionfish are often mistaken for P. antenatta in the aquarium hobby. We currently keep and study all of the lionfish species that are commonly available to the hobby, and even a few that are rather uncommon. Will check that one out. Thank you. I have to do a science project, and this was the only website that helped!! THANK YOU SO MUCH!